SNAP! I broke my ankle, now what? Our expert surgeons can fix it. 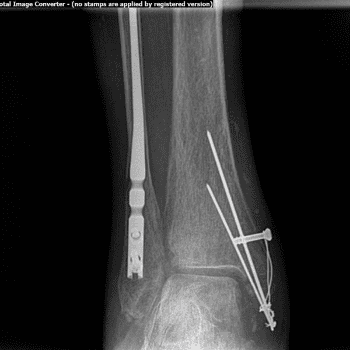 An ankle fracture is when one or both of the bones are broken in the ankle joint. Fracture can range from a simple break, which may not stop you from walking to a more complicated. Treatment is based off of the severity of the injury and the bone fractured. Sometimes ankle fracture are not displaced they can be treated with a cast. When two or more areas in the ankle are fractured or when the bones are displaced by greater than 2 mm it’s considered an unstable joint and Surgery is necessary. After an open reduction with internal fixation (orif) patients are required to wear either a cast or a below knee cam walker for approximately six weeks and then gradually come out. Weight-bearing is determined based on several different factors including bone quality, type of fracture and Age of patient. Most people return to normal daily activities, except for sport, within 3 to 4 months. Studies have shown that people can still be recovering up to five years after their ankle fracture.